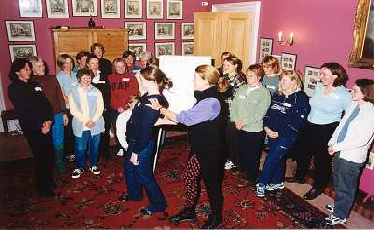 Photo Courtesy of "Scotlands' Horse News"
These workshops conducted indoors and without a horse are vital to the learning process. Step-by-step, we address posture and the theory and feel of riding to show the individual how all riding is governed by the same laws of balance which affect us in our every day movement off the horse's back. If this is not first addressed and corrected on the ground, it is unlikely the rider's aids can ever be fully understood by the horse since he will feel the smallest imbalance. Simple aids such as understanding the different feels for bend, forward, straightening, transitions to the more advanced aids for lateral work, canter changes, piaffe and passage can all be understood and improved on the ground. Anyone wishing to run such a workshop in their area, should contact my office and we can then advise. There is no financial outlay involved since the venue hire fee and insurance will be included in the ticket price. The exercises are not violent so all age groups (within reason) are welcomed, but contenders must wear trainers and easy clothing. Each workshop lasts roughly 2.5-3 hours and we recommend from 15-25 people per workshop. There is fun and laughter between the serious moments and people go away with enormously improved body awareness and a great deal to THINK ABOUT. I have received so many letters from people (even advanced riders and trainers) saying their horse improved dramatically the next time they rode it, that I know these Clinics are hugely worthwhile.